The Battle of Rovine took place on 17 May 1395 between the Wallachian army led by Voivod Mircea cel Bătrân (Mircea the Elder) against the Ottoman invasion led by sultan Bayezid I. The Ottoman army faced a much smaller Wallachian army. Legend says that on the eve of the battle, dressed as a peace emissary, Mircea cel Bătrân talked to Bayezid I asking him to leave Wallachia, and promising to grant him safe passage. However, the sultan insisted on fighting. The battle took place near the Argeș River. However the exact location of the battle is disputed, but the Wallachian victory is confirmed by numerous historians. During the battle the main role was played by the Wallachian archers, who annihilated the Ottoman ranks at the beginning of their attack. Bayazid's vassals Stefan Lazarević and Marko Mrnjavčević, the mightiest of all Serbian feudal lords, also participated in the battle; Stefan showed great courage, Marko died in battle. Another opinion is that the terrible confrontation lasted not a single day, but an entire week, being first a war of positions. The fierce battle ended with heavy casualties for both sides, at the end each army withdrew from the battlefield. Although Wallachians pushed back the enemy, the Ottomans, however were able to better defend their new backward position relying on the personal guard of the Sultan composed of janissaries. This was the inexpugnable point of the Ottoman defense, applied justly from the next year, in the famous Battle of Nicopolis. This tactical innovation became the fundamental element of the Ottoman art of war until the 18th century. The army of Mircea, sustaining heavy casualties, and in the impossibility to break the defense of Sultan's camp, was finally obliged to withdraw. However, this battle remains one of the most important battles in Romanian history. An epic description of the battle is found in the poem "Scrisoarea a III-a" (The Third Letter) written by the Romanian national poet, Mihai Eminescu. The Dečani chronicle mentions this battle and explains that Prince Marko and Constantine Dragaš died in this battle. 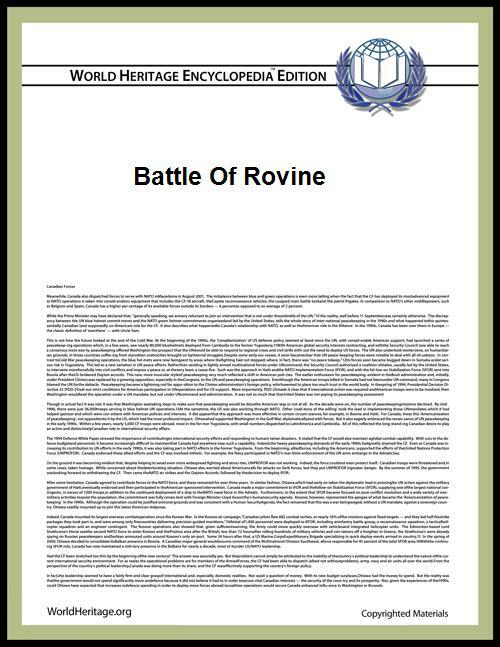 This chronicle also explains that Marko's brother, Andreja Mrnjavčević, also died in the Battle of Rovine. ^ a b Norman Angell. Peace Theories and the Balkan War. Kessinger Publishing, 2004, ISBN 1-4191-4050-7, ISBN 978-1-4191-4050-1. ^ a b Jim Bradbury. The Routledge Companion to Medieval Warfare. Routledge, 2004, ISBN 0-415-22126-9, ISBN 978-0-415-22126-9. ^ a b Norman L. Forter, Demeter B. Rostovsky. The Roumanian Handbook. Ayer Publishing, 1971, ISBN 0-405-02747-8, ISBN 978-0-405-02747-5. ^ Ostrogorsky, George. History of the Byzantine State, p.551. Published by Rutgers University Press, 1969. ISBN 0-8135-1198-4. ^ a b Dan Ioan Mureşan. "Avant Nicopolis: observations sur la campagne de 1395 pour le contrôle du Bas-Danube". ^ Ђурић, Иван (1984). Сумрак Византије: време Јована VIII Палеолога (1392-1448). Народна књига. p. 78. У Дечанском летопису је, уз вест о боју на Ровинама, забележено како су тамо погинули Марко Краљевић и Константин Драгаш.